Initially, the plan was for the voyage to be made in two vessels, the other being the smaller Speedwell, which had transported some of the Pilgrims embarking on the voyage from Delfshaven in the Netherlands to Southampton, England. The first voyage of the ships departed Southampton, on August 5/15, 1620, but the Speedwell developed a leak, and had to be refitted at Dartmouth on August 17/27. On the second attempt, the ships reached the Atlantic Ocean but again were forced to return to Plymouth because of the Speedwell's leak. It would later be revealed that there was in fact nothing wrong with the Speedwell. 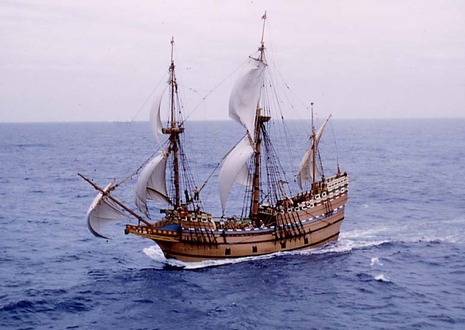 The Pilgrims believed that the crew had, through aspects of refitting the ship, and their behavior in operating it, sabotaged the voyage in order to escape the year-long commitment of their contract. 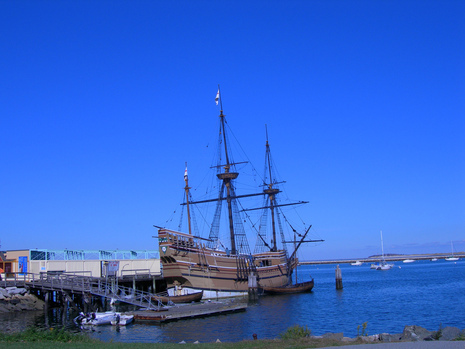 After reorganization, the final sixty-six day voyage was made by the Mayflower alone, leaving from a site near to the Mayflower Steps in Plymouth, England on September 6/16. With 102 passengers plus crew, each family was allotted a very confined amount of space for personal belongings. The Mayflower stopped off at Newlyn in Cornwall to take on water. The intended destination was an area near the Hudson River, in "North Virginia". However the ship was forced far off-course by inclement weather and drifted well north of the intended Virginia settlement. 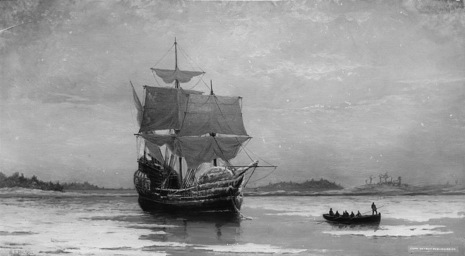 As a result of the delay, the settlers did not arrive in Cape Cod until after the onset of a harsh New England winter. The settlers ultimately failed to reach Virginia where they had already obtained permission from the London Company to settle, due to difficulties navigating the treacherous waters off the southeast corner of Cape Cod. 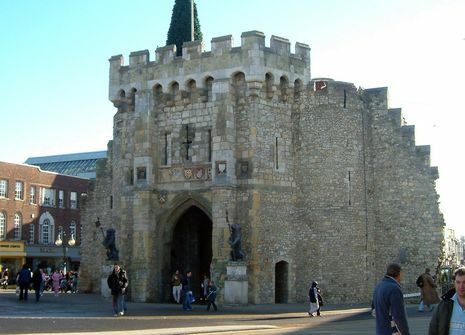 The Mayflower Steps are believed to be close to the site in the Barbican area of Plymouth, south-west England, from which the Pilgrim Fathers finally left England aboard the Mayflower, before crossing the Atlantic Ocean to settle in North America on 6 September 1620. The traditional site of their disembarkation in North America is Plymouth Rock. The passengers who came predominantly from East Anglia sought religious and other freedoms. They had no links with Plymouth, but because of bad weather in the English Channel they were forced to put in at Plymouth seeking shelter and essential repairs. Several surviving local buildings including what is now the Plymouth Gin Distillery in Southside Street and the Island House on the Quay are claimed to have accommodated some of them for one or more nights. The 'Steps' today consist of a commemorative portico with Doric columns of Portland stone that was built in 1934, and a small platform over the water with a brushed steel rail and a shelf with some nautical bronze artwork and historical information. 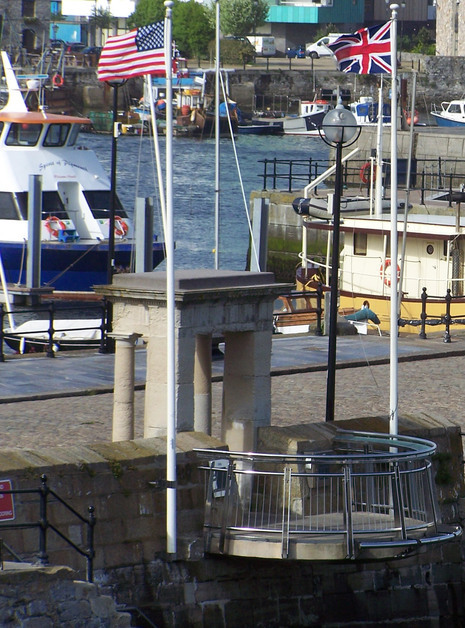 It is on a small pier that was built about a century ago when some very old houses that were blocking construction of a road around the seaward side of the Citadel leading to the Hoe were cleared together with the significant Watch House. Today, boat trips leave the Mayflower Steps for trips around the Sound and up the Tamar for sight of the 'Dockyard and Warships'. The best effort by local historians to place the actual site of the Mayflower finally casting off is roughly where a Victorian public house, the Admiral MacBride, now stands.